Our hospitality personnel –courteous, reliable, good-looking and absolutely professional. Your customers will be serves by the best service staff you could ever wish for. easystaff makes this wish come true! Our fair hostesses and event staff will be at your guests' side at every kind of event imaginable. Our staff make more than just a good impression at conventions, seminars and conferences and impress with their perfect all-round service. Our hospitality personnel represent you and your company – it is a reflection of your brand presence. easystaff therefore attach great importance to charm, friendly manners and, of course, expertise. A trade fair stand or convention is only as good as its atmosphere – and it needs a certain something. And that's exactly what our easystaffers have! Our staff create a pleasant atmosphere and convey a positive impression of your company. Your customers will feel completely content thanks to the sophisticated guest hosting. Our project managers know the hostesses thanks to long-term collaboration. That guarantees full success! Your guests should immediately feel as though they are in good hands at your event. This begins with a friendly reception at the registry or cloakroom and ranges from issuing giveaways or follow up information at the hospitality desk. Our hostesses look after all your customers request in a charming and competent manner. As with all our services, you'll profit from first-class project management. A project manager is responsible for you – our highest premise is getting the hospitality staff ordered by you on time and making your assignment goes smoothly. VIPs give any event a special glamorous touch. These special guest also deserve special VIP guest hosting. Our hostesses are specially trained in looking after VIPs and score points from prominent guests thanks to their multilingual capabilities and their professional manners. Our hospitality staff also make a good impression as stage hostesses at any event. 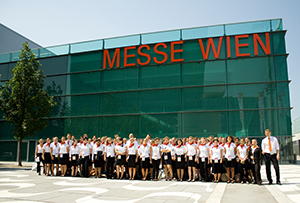 Trade fairs sometimes last several days – therefore the demand placed on trade fair hostesses is also correspondingly high. Simply looking good is not enough for high-quality trade fair stand support. We will give you – our customer – total commitment. Your guests will always be met in a friendly way, all questions will be competently answered in a pleasant discussion atmosphere thanks to our excellent product training. 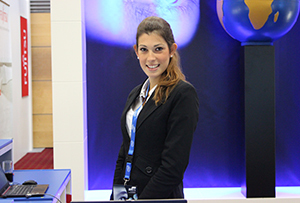 Our easystaff trade fair personnel know: We always have to convey a positive impression of your company. As an easystaff customer, you'll receive the best all-round support for your convention or seminar. 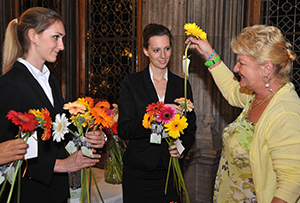 Our hostesses and staff attentively look after your participants from start to finish. Our long-term collaboration with our experienced hospitality personnel makes a very high-quality event worth seeing possible. Do your VIP guests need to be brought to your event from their hotel on time? 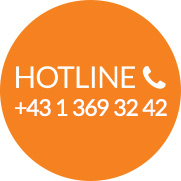 Does an important customer urgently need to be picked up from the airport? No problem! Upon request, easystaff also does transfers and provides experienced chauffeurs. Your VIPs will always arrive on time with our shuttle service. Our event personnel turn every event into a real experience for you and your guests. You'll get all necessary event staff from a single source from easystaff – from guest reception and service staff through assistance with setup and dismantling and much more. The scale of your planned event doesn't matter. All our staff are optimally briefed and trained for your event. A project manager is directly available as an exclusive contact partner. Our professionally trained logistics specialists will be at your side so that the back office runs smoothly and for both during the event and for setting up and dismantling before and after the actual event. From loading equipment and handling goods through to setting up the location and managing manipulation – our easystaff logistics specialists are completely motivated and are ready to pitch in at any time. This will also make your event a complete success behind the scenes. Our trained security staff provide the best security solutions at your event. Discreet, friendly, cautious but also determined if need be, our security guards are trained in accordance with the latest standards. Customised security concepts make your guests feel even more safe. From securing the VIP area through to supervising audience areas, like at concerts or entrance checks at events – play it safe with easystaff! "All staff did a fantastic job! They were all very motivated and looked after the guests perfectly. A BIG THANK YOU again to the whole team. I would also especially like to thank the project manager – he had everything more than under control!" "When you work with easystaff, you can really count on the quality of the staff – as Ovation Austria/MCI Wien GmbH, we can't recommend easystaff enough". "We always jump at the chance to work with professional easystaff personnel at business events that we at the Opinion Leaders Network organise for big customers, such as T-Mobile, ÖBB, The Austrian Federal Economic Chamber, Wolf Theiß, W24. 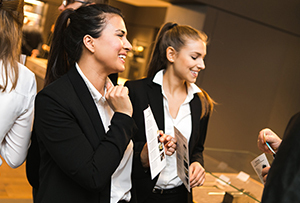 Whether pretty hostesses, professional check in staff, top security or highly-motivated and qualified service personnel – with easystaff, we have found a solid partner for the Opinion Leaders Network's agency events unit". Are you looking for reliable staff?